UPDATE: Nearly two months later...NO GLASSES, NO REFUND, NO APOLOGIES. I was told 'the case is closed.' Avoid this miserable scam company! I want to warn my friends about the GlassesUSA.com scam. Sure, they offer very cheap glasses and a wide variety of styles. They promise quick delivery, top quality...blah blah blah. But I never got them as promised. I was told DHL attempted delivery but I was "not at home." Bunk. I work at home every day. I WAS home. I've not left this house in a month. I was then told to contact DHL for delivery. The tracking number didn't work. And why is a US-based company even using DHL for anyway? Makes no sense. So I asked GlassesUSA why they use a foreign service. The answer I got was it was because the glasses are made in Europe. Ha ha. Why not 'GlassesEurope?' Oh wait a minute...they lied about that, too. The company has little to do with the USA at all. GlassesUSA, LLC was founded in 2009 and is based in Bnei Brak, Israel. The new tracking number didn't work. I will never get the glasses. Most likely, they were never even shipped and GlassesUSA probably never made them. They probably knew Montana delivery wasn't possible so they simply pretended! They lied to me. I was ripped off. DHL closed down all operations in Montana and Wyoming back in 2008. Have they reopened an office? Missoula? It's unclear. Do I ever see DHL trucks in the area? Never. Is there some sort of satellite grouped with some podunk, obscure mailing service outlet somewhere? 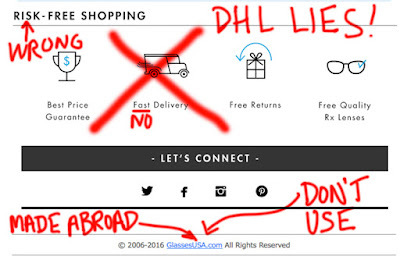 Possibly, but if DHL was even involved at all in the first place, then they outright LIED to GlassesUSA. Why? Because I was informed by GlassesUSA that DHL said they made 'at least' THREE attempts at delivery. Impossible! I'm always here! 'At least' is the tipoff that they're lying. What, they don't know exactly how many attempts were made? WTF does 'at least' mean? So many attempts paints me as the bad guy. It's MY fault for being home and not seeing the invisible DHL truck pull up. Their tracking records note one attempt and I doubt that was even made. No note was left on the door about where to go to pick up the glasses. I have been home all day each day for the past month. My wife does the shopping. I stay home and work. I've had a lot of work and I'm in my office ALL DAY. If a DHL truck had pulled in, well I would have seen it. My office window faces the driveway. I would have seen AND heard it! THEY ARE LIARS! And as far as I'm concerned, so is GlassesUSA.com! If there had been an attempt at delivery, the dog would have started barking and I would have been made aware if I was out of my office and in another room. I would have been aware of any delivery attempt. We live in a quiet area. It would have been obvious. So DHL lied. GlassesUSA is disingenuous at best. They should drop 'USA' from their name. If the prices seem very low and 'too good to be true,' well...that's always a clue, isn't it? Beware of scam artists--they're everywhere.